Queer Projections‘ 2013 inagural event celebrating pride on the Sunshine Coast screened Margarita, a feature-length Canadian film. Feedback from the event was positive. Margarita is a story of love and paperwork. 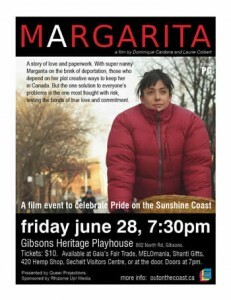 On the brink of deportation, those that depend on Margarita plot creative ways to keep her in Canada. But the one solution to everyone’s problems is the one most fraught with risk, testing the bonds of true love and commitment. In six years of working for a wealthy Toronto family, beautiful and resourceful Margarita, the Mexican super nanny, has also become the family’s housekeeper, chef, gardener, and interior designer. If that wasn’t enough to keep her busy, she’s also found her true love Jane, a cute but commitment-phobic law student. When financial disaster forces the family to fire their nanny, Margarita receives a surprise deportation order, and the deluge of proposals to keep her in the country start pouring in with comic, and ultimately romantic, results. Funny and heart-warming, Margarita, touches on issues of race and class, while at its heart, is defined by what makes us most human: the nature of our relationship with ourselves and others. Rated PG. Starring Nicola Correia Damude, Christine Horne, Claire Lautier, and Patrick McKenna, and directed by NFB veterans Dominique Cardona and Laurie Colbert, Margarita is an audience favourite everywhere it screens. It won the Audience Award for Best Feature at Inside Out, Toronto (2012), High Falls Film Festival, Rochester, NY (2013), Women’s International Film Festival, France (2012), London Lesbian and Gay Film Festival (2013), as well as the Best Canadian Feature in London, and the Diversity Award for Best Feature at the Barcelona International Film Festival (2012). Visit the Sunshine Coast Pride website for listing of events in pride month. Let us know what you think about the Queer Projections films. We want to hear from you. CONTACT US. Queer Projections aims to bring queer films to the Sunshine Coast in order to promote LGBTQ visibility and encourage communication and connections across our varied communities. Through these film events, we hope to foster understanding, equality, diversity and counteract the effects of homophobia and discrimination. Queer Projections Copyright © 2019.